Mercedes-Benz has just revealed the AMG A35 sedan, which, in essence, is a sporty version of the regular A-class sedan. The A35 is the German carmaker’s newest entry-level performance sedan and is positioned below the AMG’s C43 sedan in the international market. It is powered by the same 2.0-litre, four-cylinder engine seen in the A35 hatchback that produces 306hp and 400Nm of torque. The engine is mated to a 7-speed dual-clutch automatic transmission and power is sent to all four wheels via Mercedes’ 4-Matic all-wheel-drive system. According to AMG, the A35 sedan can do 0-100kph in 4.8sec, just 0.1sec slower than the hatchback, while top speed is electronically limited to 250kph. On the design front, the A35 sedan features a front end similar to the A35 hatchback and comes with enlarged air intakes, front splitter and gets 18-inch alloy wheels as standard. It also features a liftback look at the rear, with an aggressive rear diffuser and twin-exhaust system. An optional AMG aerodynamics package tweaks the front splitter and adds a rear lip spoiler. The interior is equipped with Mercedes’ MBUX multimedia system, along with a fully digital instrument cluster and infotainment screen under one piece of glass. The instrument cluster can be customised with different modes, including Supersport mode that adds AMG-specific data such as G-Force readings and track telemetry. The car also gets AMG sports seats in the front. An AMG performance steering wheel (same as the one seen on the AMG C63) is available as an optional extra. 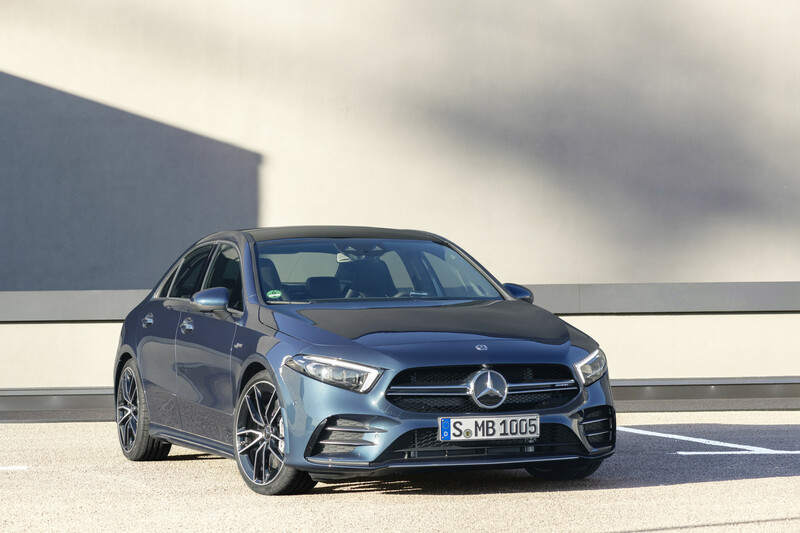 Mercedes has made no announcement regarding an India launch for the sporty AMG A-class sedan, though the standard A-class sedan is being considered for a 2020-21 launch. The German carmaker has also recently launched the C43 Coupe in India at Rs 75 lakh (ex-showroom, India). The C43 Coupe is powered by a 3.0-litre, twin-turbocharged V6 engine.